I’ve been having a lot of fun constructing the kitchen cabinet hardware. 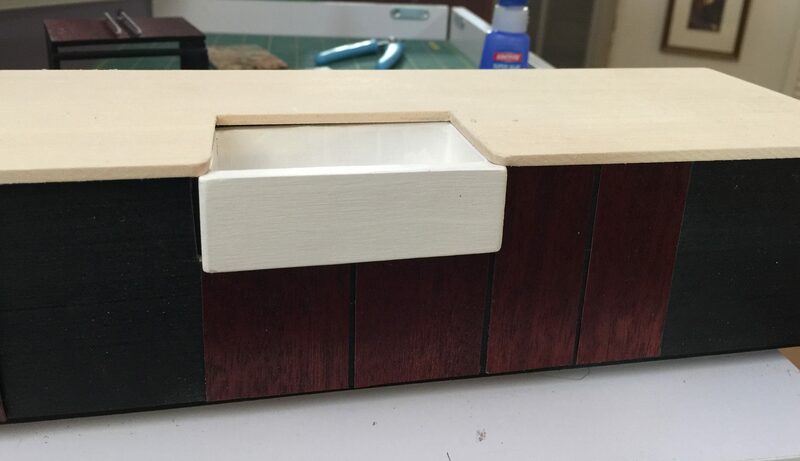 I struggled with how to make the handles for the cabinets and drawers. 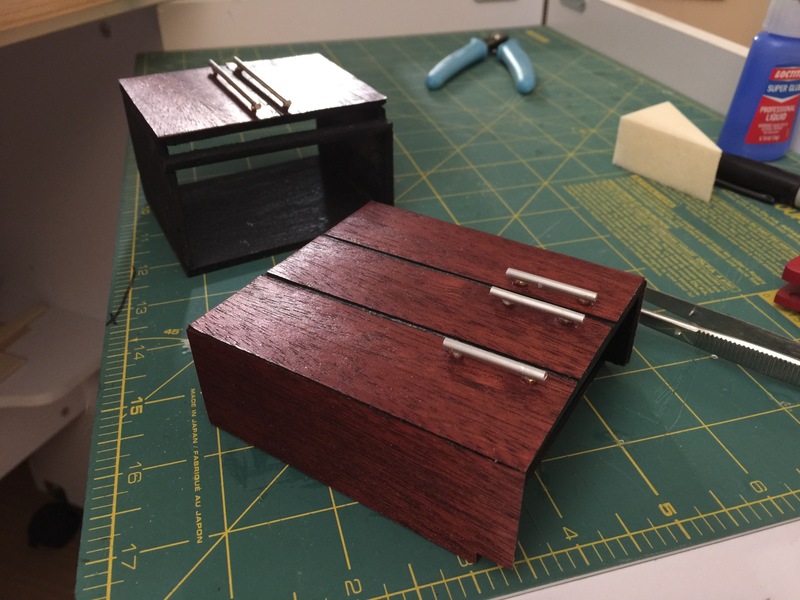 I knew I could use tiny aluminum rods to make the bar style handles, but I could not figure out how to attach them to the cabinets but not directly flat onto the cabinets. I wanted them to be on some kind of riser so that they stand above the cabinet or drawer surface. But it had to be something that I could glue to a rounded rod surface. What to do, what to do…? First I tried Fimo. Nope, nope, nope. Then I just sat and cogitated for a while. Bingo (light bulb goes on above head, like in a cartoon), what about a tiny silver bead? Then to work, rooting around through my bead stash (I sometimes make jewelry), and presto, a small tube of tiny silvery glass beads. 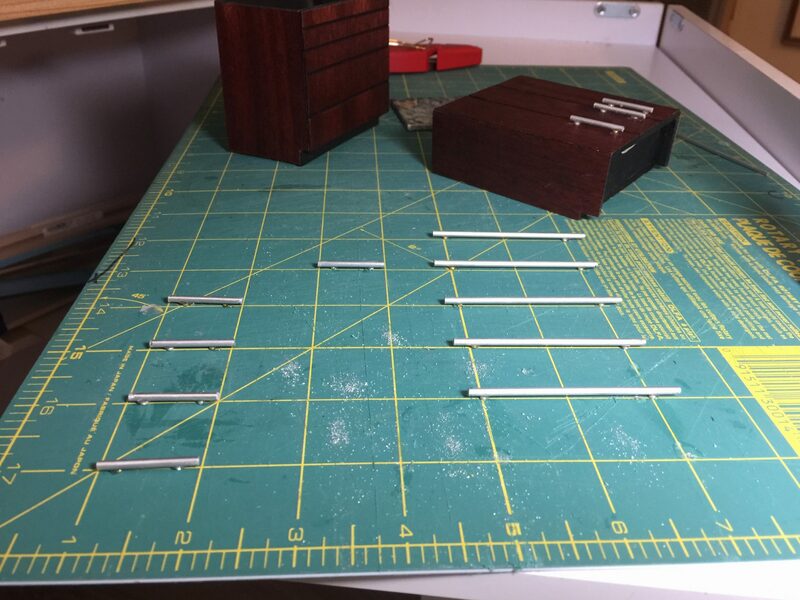 Lay them out, a drop of super glue, set the aluminum rods onto the beads and wait for them to dry. It worked! Yaaaayyyy! You can see two smaller cabinet handles at the upper right in the photo. The handles do stick to the cutting mat so they have to be gently detached with a craft knife or box cutter blade. If they fall off, as they sometimes do, I just re-glue them. In the background of this photo above, you can see the upper cabinets with handles already glued on. You can see the black paint showing through for contrast. 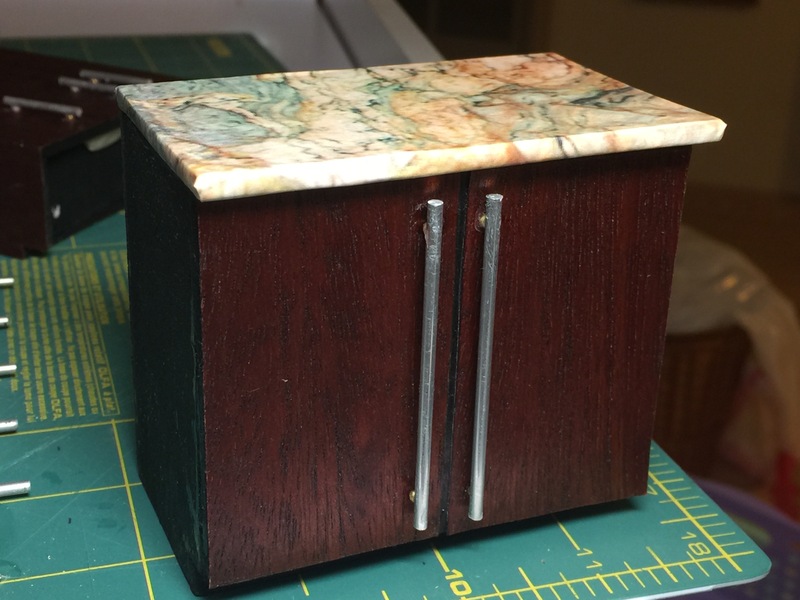 The “granite” countertops were fun to make. I “shopped” for the granite by going online and saving many photos of marble and granite. 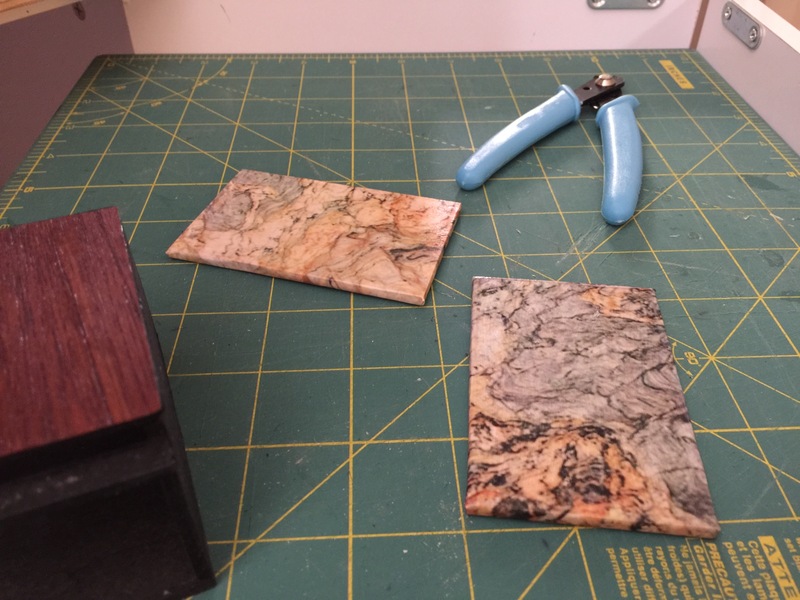 Then I printed them all out and wrapped them around the peninsula countertop basswood (countertop shows in the above photo with no “granite” applied) and then picked the one I liked best. I absolutely love spalted maple. The pattern created by the fungus as the wood decays is gorgeous. 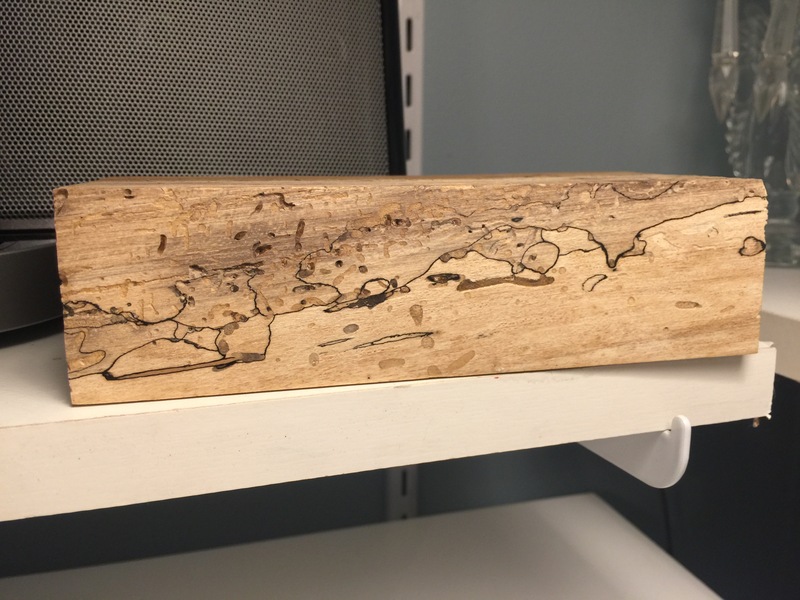 The wood is treated to stop the decay, and the wood artist sealed the piece. Can’t wait to install it! This wood artist has a lot of other beautiful things in his Etsy shop too.